wastewater and provide a clarified effluent for disposal to the drain field. results in three products: scum, sludge, and effluent. surface in the tank. Aerobic bacteria work at digesting floating solids. outlet into the drain field. wastewater sits in the tank. be able to provide two to three days of retention time. 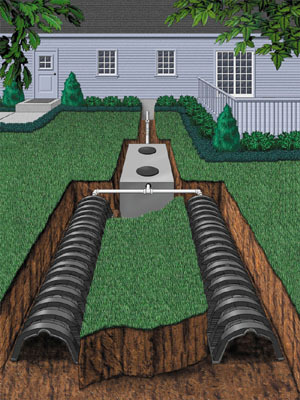 storage time can only be determined by routine septic tank inspections. (T-shaped pipes with one short and one long leg). flows across the water surface directly to the outlet. sanitary tee can be used with the lower leg extending below the scum layer. tank, and particles of sludge can be carried upward by these rising gases. away from the outlet and preventing them from entering the drain field. drain field, and the filter is effective in preventing this. those produced in a non-screened system. rates and extend over a longer period of time than the incoming surges. disappearance was therefore due to solution and gasification."